Multiliteracy Topics Select Category Assessment & Policy Critical Perspectives Global Multiliteracy In the Classroom Resources Social Networking Technology The Arts The Media What is Multiliteracy? If you like what you read here, please link to us from your blog or website! Leave your address as a comment and we will add you to our blogroll....Lets make a Multiliteracy Network!! 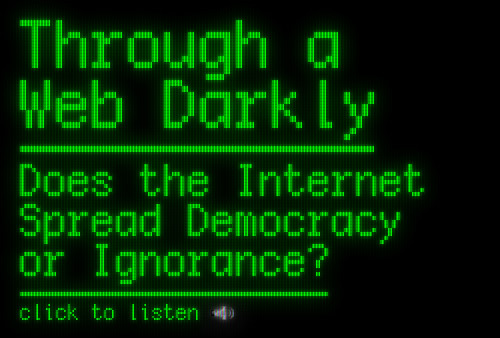 Over at the Open Society Institute, I found an interesting discussion entitled Through A Web Darkly: Does the internet spread Democracy or Ignorance?. It deals with the melding landscapes of technology, information and government control. I would recommend listening to it as it touches on some key issues being discussed in technology circles, but in terms of multi-literacy I think it really gives us some important things to think about. One of the themes that arose on a couple of occasions was that of the ‘fragmentation of media platforms and experiences and their relationships to media literacy.’ Similarly, another panel member’s states that there are now different (yet specific) types of intermediaries for organizing information and directing attention. What we are seeing then is that being literate is taking on an increasing number of forms and that the way we interact with these new literacies is determined in a growing number of ways. In some cases, the way we adapt to these new literacies is determined by very specific key players, namely Google and Facebook (among others let influential ones). On the other hand, the increasing number of users utilizing new literacies, combined with the increasing number of information providers that are trying to cater to these new users, means that new literacies are being constructed and re-constructed everyday. For these new literacies the emphasis will be the ability to adapt and utilize them as they come into being, rather than being proficient in any one. This brings up issues of credibility, reputation, and veracity, since the sheer amount of information available is rapidly increasing. In relationship to education then, I would argue that it is crucial to incorporate critical thinking into the way that students understand and utilize new literacies. Otherwise, they will not have the skills to weight the relative merit of these various sources of information or the ability to maximize the constructive/expressive potentials of these literacies. Another topic the panel touched on was government control of new technologies and information. While this strays from our topic of multiliteracies, it does suggest that multiliteracy technology is difficult for the government to control and therefore has the potential to contribute to the creation of more open societies. This means that as we give students the capability to apply critical thinking to new technologies via multiliteracies, we are in fact empowering them to utilize new literacies and be part of the process of social transformation in a conscious and pro-active way. Click here to listen to the entire discussion. This entry was posted on July 19, 2011 at 1:34 am	and is filed under Critical Perspectives, Global Multiliteracy, Social Networking. Tagged: critical thinking, democracy, fragmentation, government, multiliteracies, open societies. You can follow any responses to this entry through the RSS 2.0 feed. You can leave a response, or trackback from your own site.